Actually, the building has left Saint Gabriel. According to the book of Daniel (and Wikipedia) a being resembling a man and identified as Gabriel appears to the prophet Daniel to give him “skill and understanding” regarding his visions. I’m fairly sure my genealogy research does not rate as “having visions”, although I’ll gladly take some skill and understanding. 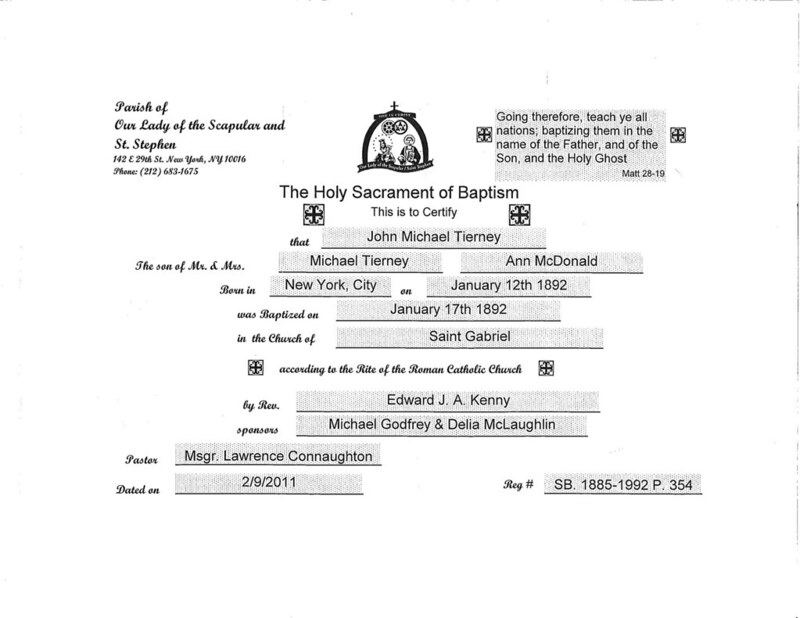 As of late I have been tracking down various documents for my Tierney family in New York, all the while hoping that one might offer a clue to their origin in Ireland. I am happy to say that each new document I find has offered at least some tiny tidbit of information or led me further down the path to the next record. However, my Tierneys seem intent on stringing us along when it comes to where they came from in Ireland. My list of records to find in New York has included my great-grandparent’s marriage certificate, their death certificates, plus the birth and baptism certificates for my grandfather and his siblings. 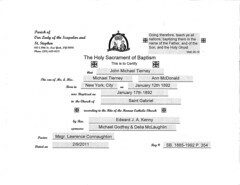 Using the Catholic Church Registers list at rootsweb and a few other pages that have now succumbed to the Internet abyss I began to inquire at various churches near East 35th Street to see if any of these records might be extant. In this sort of search, the time to receive responses to inquiries can be painfully long and eventually I heard back from what I thought was my best bet of the bunch: the Church of St. Stephen. No joy ensued. So I expanded my Circle of Attack® by using the Demolished Churches in New York City list and some almanacs on Google Books to see if any churches no longer around might be possibilities. At the same time I was reading one of my new favorite books The New York Irish and noticed a mention of a St. Gabriel’s Church on East 37th Street. I performed some quick research and found a terrific entry in The Catholic Church in the United States of America, Vol III (1914) describing the origins and history of St. Gabriel’s starting in 1859. I wrote to the Archdiocese of New York to ask where the records for St. Gabriel’s might be now and they promptly responded: they were now at the Church of St. Stephen! And what, pray tell, became of St. Gabriel’s Church on East 37th Street? A great hole opened up and swallowed it. Well, sort of – it was demolished in preparation for the opening of the Queens Midtown Tunnel in 1939. As you can see from these two photographs, it was a beautiful gothic style church and was certainly a sad thing for the neighborhood to lose. One consolation: the altar, pews, statues (and pastor) migrated to a newly constructed St. Gabriel’s Church in the Riverdale section of the Bronx. See my next post Gabriel Keeps Calling for an appearance of St. Gabe’s in a painting by Martin Lewis. Great story, John. This one certainly tried your patience. Great detective work and a very well-told story! Thanks for sharing your journey. Wishing you the luck of the Irish to find your Tierney origins in Ireland. If they end up in Tipperary, let me know! Might be my only hope left of a document with their Ireland origin listed. My mum is a Tierney from Oughterard in Co. Galway Ireland. Do you know where your ancestors come from??? I haven’t found where my Tierneys came from yet – it has been a main focus for me but nothing definitive has popped up yet. In an old tree based on an interview with my Aunt it says my GGF Michael Tierney was from Roscommon, but none of the sources I’ve turned up here in NY mention anything but Ireland. I had high hopes for his 1885 naturalization in NY, but it had little info on it. I recently was tested at Family Tree DNA – I only match one of the dozen or so people in the Tierney surname group there and he’s at the same spot in his research as I am. However, I do have some fairly close matches with a few people in the McTiernan surname group on FTDNA (along with the same person mentioned above) but I haven’t heard anything from the admin of that group on the men I match. Quite a few of the people in the McTiernan group are from Leitrim and nearby in Roscommon so that might be a good place for me to focus for now. Nothing obvious has turned up for my when searching Rootsireland.ie for their records either – having everyone named John & Michael sure doesn’t make it easy. If you have any suggestions on searching for my Tierneys, I’d love to hear them! At this point I think I may just have to start walking Ireland and knocking on doors. Great post. My great-great-grandmother and her family would have been neighbors of your ancestors. They lived on East 36th, 37th and 39th near 2nd Avenue at various times. I learned when doing my own research that everyone in the family was christened and married at St. Gabriel’s. Thanks Rob – I’m still trying to find my great-grandparents’ marriage record – wish I could flip through the original books at the church! I took a walk around the neighborhood a few months ago and there are many nice original buildings still there. Think I need to post some photos here….